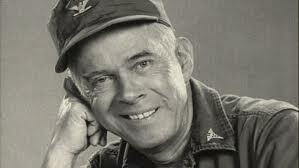 Sad news out of the City of Angels … Harry Morgan, better known for his role as Colonel Sherman T. Potter on ‘M*A*S*H’ and Officer Bill Gannon of ‘Dragnet” fame has passed away at the age of 96 at his home in Los Angeles. His career spanned the decades and he was in over 100 movies; however, is best known for his role as Col. Sherman T. Potter of the 4077th Mobile Army Surgical Hospital unit in the Korean War on the TV series from 1975 to 1983. He is survived by his wife, three sons, eight grandchildren and nine great-grandchildren. Harry Potter discusses his years on M*A*S*H … “I have never been on a show where I actually liked every person on that show very dearly”. His son Charles confirmed his death, saying Mr. Morgan had been treated for pneumonia recently. Even though I actually preferred M*A*S*H when Mclean Stevenson was in charge of the 4077, I much enjoyed Morgan’s role on Dragnet, officer Bill Gannon, the perfect compliment to Jack Webb. Check out the VIDEO below of Harry Morgan discussing Dragnet, his role of officer Bill Gannon and Jack Webb.